Of all the tributes to Dr Martin Luther King I think I prefer this one to all the others. The attack from the horns and the busy drummer really set out the song, and the fills from the guitarist are beautifully done while Chapman's sense of grief mixed with pride is palpable. Also the 45 was cut really "hot" and the sound just leaps off the turntable. 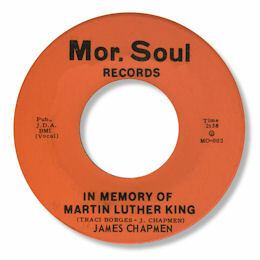 Mor Soul was a New Orleans label - note the involvement of long time Crescent City record man Traci Borges.